Once upon a time, in the Deep Dark Wood that lies on the edge of the Wide-and-Windy-Common, there lived a fairy called Thistledown. 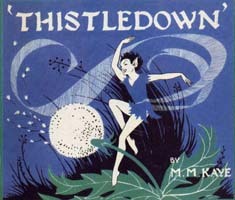 Thistledown was a lady-in-waiting at the court of Queen Mab, and on ball nights no one danced as beautifully as she. One evening, as Thistledown was sitting on a scarlet toadstool, there came a whisper and a ripple through the grasses as the Wind slipped into the woods and perched beside her. He was a slim, brown, pointy-faced fairy with twinkly eyes and wild dark hair. The Wind praised her graceful dancing and her lovely face, and told her she was quite wasted in so gloomy a place until in the end he quite turned her head and she began to put on airs, and ordered dozens of new frocks from the fairy dress makers and numerous pairs of shoes from the goblin cobblers. Thistledown would spend hours every day in admiring herself in her dew-drop mirror. Indeed, she grew so vain that at the next court ball she refused to dance at all. Because, she said, her dancing was much too clever and too beautiful to waste on mere forest fairies. Eventually Queen Mab lost all patience with her and turned the vain little fairy into a Powder Puff and banished her for ever to dance on the Wide-and-Windy-Common. And there you may see her, or her children, to this day, dancing with the wind, a powder puff on a pale green stalk. And when the wind grows rough, she leaves her stalk and away she flies over the Common in an airy cloud of Thistledown.